Forty-five minutes away from UC Santa Cruz, 3175 Bowers Ave. swarmed with excitement. On the evening of Sept. 28, community members, UCSC staff and alumni convened at the entrance and stared at a ribbon blocking off the front door. “I’d like to invite a special guest from the robotics program to do the honors,” said Vice Chancellor of Research Scott Brandt. 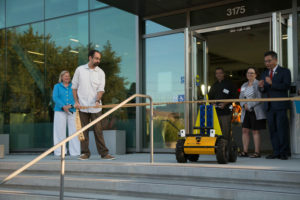 With that, a robot emerged from the crowd and cut the ribbon, officially opening the UCSC Silicon Valley campus. The campus opened its doors to the public in Santa Clara with an open house and TED talk style lectures. Notable attendees, including UCSC Chancellor George Blumenthal, Assemblymember Kansen Chu and Sen. Bob Wieckowski, stood surrounded by mingling guests discussing the plans and future of UCSC Silicon Valley. Known as the Bowers Building, the 90,000 square foot facility cost roughly $46.5 million and has state of the art equipment, including sound booths and a production studio. The campus includes UCSC Extension, the games and playable media masters program, more than 40 certification programs, UCSC research programs and UC Scout — an online course for students across the globe. UCSC Extension, a program that has existed for the past 40 years and is the first UCSC program to inhabit Silicon Valley, offers accredited online and onsite courses for working and potential professionals in Silicon Valley. The UC previously leased multiple buildings in Silicon Valley to house the extension program and university research. 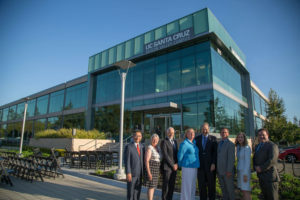 When the main building they were leasing was bought out by the Irvine Company earlier this year, UCSC decided to purchase a larger, permanent property in Santa Clara. Due to the strong partnership the courses have with the surrounding tech companies, the building’s location was crucial. The institution brings the accessibility of the UC system to a growing high tech industry. The classes allow for flexibility with students schedules, making it easier to work while pursuing higher education. With only about half the campus currently occupied by classes and offices, the new building allows for expansion. There are plans to introduce a serious games master’s program to accompany the already existing games and playable media master’s program, focused on games for purposes rather than entertainment — potentially including educational games and therapeutic games. UCSC will introduce this and two other master’s program surrounding games and computer science on the Silicon Valley campus within the next few years. “We’re trying to find these areas where we can have an impact,” EVC Alison Galloway said. The new facility and the extension classes are available to the public, as well as all UCSC students. The classes, which require no application, help students of all levels master new skills.